Leaders for Tomorrow: The Murray Bowen Archives, a 501 C is supporting the efforts of the National Library of Medicine (NLM). The goal, to open the Murray Bowen archives at NLM. You will find some of his original papers posted there.. and more pictures. Murray Bowen, M.D. the originator of family systems theory and psychotherapy, was the first to develop a comprehensive theory of human behavior. It is based on the factual evidence that the family functions as an emotional system with its roots in evolutionary processes. Bowen theory offers a completely different view of the human family than conventional psychiatry, which is focused on inner psychic mechanism. The advantage of seeing how people function as part of a system, leads to a focus on relationships between people over time. In order to collect and preserve Bowen’s original papers and videos and to collect information about the impact Bowen had on his professions and finally to make this information available to the public, Leaders for Tomorrow (LFT) was formed to work with The National Library of Medicine , were the collection is maintained. As one of the directors of (LFT), a 501 c nonprofit, I am have asked people to donate money to have Dr. Bowen’s archives properly organized and accessible by 2013—the 100th Anniversary of his birth. The National Library of Medicine (NLM) has been given the Bowen archives, by the Bowen family and The Bowen Center for the Study of the Family and other centers around the country where Bowen presented his ideas. The Bowen archives is one of the largest collections of papers and the largest by far collection of videotapes that NLM currently maintains. In addition NLM contains the archives of many of the people involved with Bowen in the early 1950s at the – National Institutes of Health (NIH), such as Jack Calhoun and Paul D. MacLean. John B. Calhoun (May 11, 1917–September 7, 1995) was an American ecologist and research psychologist noted for his studies of population density and its effects on behavior. He claimed that the bleak effects of overpopulation on rodents were a grim model for the future of the human race. During his studies, Calhoun coined the term “behavioral sink” to describe aberrant behaviors in overcrowded population density situations and “beautiful ones” to describe passive individuals who withdrew from all social interaction. His work gained world recognition. A physician and neuroscientist Paul D. MacLean. developed the triune brain model. It is a model of the evolution of the vertebrate forebrain and behavior. MacLean originally formulated his model in the 1960s and propounded it at length in his 1990 book The Triune Brain in Evolution. The triune brain consists of the reptilian complex, the paleomammalian complex (limbic system), and the neomammalian complex (neocortex), viewed as structures sequentially added to the forebrain in the course of evolution. The triune brain hypothesis became familiar to a broad popular audience through Carl Sagan‘s Pulitzer prize winning 1977 book The Dragons of Eden. NLM’s goal is to make Bowen’s work available to the public. While some of the Bowen collection is now available to qualified researchers far too much still awaits the processing and archival skills that will make it truly available to the public. LFT can help with this important project. Why does this matter? Bowen like Darwin, saw the evolution of man’s connection with other life forms. He knew that a new theory of human behavior had significant implications for the application of theory which would require a new method of psychotherapy. The theory is based on the deep nature of human behavior. Seeing the family as an emotional unit has far reaching implications for health, leadership, and gives us a profound method to enhancing choice and encourage creativity in individuals interested in developing a more mature self in an emoitanl system. Knowledge of the nature of emoitanl system prepares poeple to be less reactive to the way systems function. Few would argue that the effort to understand human behavior is now more needed than ever before. Murray Bowen communicated a different viewpoint and an approach to living one’s life through understanding which has helped thousands. I know this first hand. I met Bowen two years after my divorce, following the deaths of my parents and grandparents. 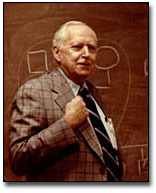 Dr. Bowen’s insights and theory helped me understand and deal with my family system, which was collapsing around me. In short, Bowen Theory gave me a road map that helped stabilize my family, reduced my sensitivity and dependency on others, and made possible the gift of self-regulation through awareness. By enabling The National Library of Medicine (NLM) to open Bowen’s work to the public, you and I can do our part to make Murray Bowen’s innovative, life-giving theories and therapy accessible to the world. We can give NLM a hand in opening up this treasure chest for countless others. Dr. William Dwyer, 301 Belvoir Avenue, Chattanooga, TN 37411. Bill Dyer is Treasurer of LFT. Please e mail him if you have any questions. Thank you for any gift you can give.